Tickets are $10 per person. Student Night Out tickets will be offered as an option when you register for the meeting. The American Association of Physicists in Medicine will honor AAPM award winners during a ceremony followed by a wine and cheese reception on Monday, August 5. Please remember your tickets. Deadline to register is July 5. There is no on-site registration for this event. The 5K course starts and finishes in White River State Park, which is within walking distance from the J.W. Marriott and other nearby hotels. Registered participants must come by the AAPM Meeting registration area in the convention center on Monday, August 5, between 10:00am and 2:00pm, to sign a waiver and pick up a race number and t-shirt. The deadline to sign up for the Dr. Charles Lescrenier Annual 5K Run/Walk sponsored by GAMMEX has passed. No on-site registration. Deadline to register is July 19. There is no on-site registration for this event. The AAPM Women Professionals Subcommittee (WPSC) would like to invite women physicists to participate in a unique networking event for women medical physicists during the annual meeting in Indianapolis. This lunch event is designed to provide women physicists an opportunity to interact with each other and women leaders from clinical, academic, and industry settings. It is also an opportunity to network, discuss issues pertaining to women's professional development, and for you to share your ideas on how the WPSC can best serve your needs. Night Out - Jeans and Jerseys! It's Jeans and Jerseys Night -- wear your favorite NFL team jersey! Even non-sports fans will get a visual thrill in this Superbowl venue. Off the field: Guests who prefer to sit and chat with colleagues will have plenty of seating above the field; all the action will be on the Jumbotron. Please note that this ticket is included in some registration categories. 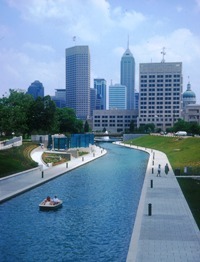 Tickets may also be purchased on-site at the AAPM registration area in the convention center located near the Capitol Avenue Lobby, Level 1 of the Indiana Convention Center. Exhibitor Sponsored Events are posted here as a service to our exhibitors.